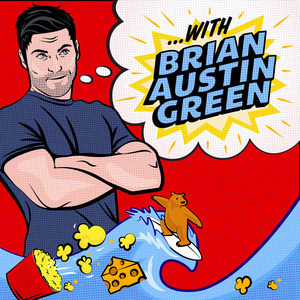 64 episodes of ...with Brian Austin Green podcast since the first episode, which aired on April 24th, 2017. Episode 64: "The Tao of David Silver with Brian Austin Green"
Episode 63: "Social Media with Brian Austin Green"
Episode 62: "Remembering Luke with Brian Austin Green"
Episode 61: "Crystal Method Acting II with Brian Austin Green"
Episode 60: "Sofa King with Brian Austin Green"
Episode 59: "The Writz with Brian Austin Green"
Brian and Derek are joined by TV Guide Magazine's Damian Holbrook to talk things they have and things they haven't. Episode 58: "Potholes in my Lawn with Brian Austin Green"
Episode 57: "Malibu with Brian Austin Green"
Episode 56: "Tile with Brian Austin Green"
Episode 55: "Emoting with Brian Austin Green"
Episode 54: "Violently Ill with Brian Austin Green"
Episode 53: "Live in Atlanta with Brian Austin Green and Ian Ziering"
Listen to our live show from Switchyards Downtown Club in Atlanta, GA benefitting Generosity.org. Episode 52: "Guantanamo Bay with Brian Austin Green"
Episode 51: "Two Shirts with Brian Austin Green"
Episode 50: "Point of No Return with Brian Austin Green"
Episode 49: "Don't Blink with Brian Austin Green"